Even with temperatures rising, soup is the way to begin a meal in Poland, so much so that I’ve had a waitress argue with me when I ordered a salad for a first course. With that thought in mind, I shared three great cold soups recipes in a cooking class this week. It was a good excuse to spend time with my old friends. 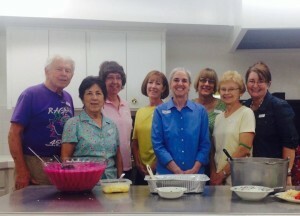 On Monday night, we gathered in the church kitchen, diced up a ton of vegetables, and created some light, vegetarian soups that are perfect for summer, but we didn’t stop there. One of my friends has an herb garden, so we whipped up a garlic herb compound butter — just the thing to go with a couple of loaves from our favorite bakery. It’s so easy to do. We used two sticks of soft butter, a minced clove of garlic, a pinch of salt, and a 1/4 to 1/3 of a cup diced herbs. We used lemon thyme, flat leaf parsley, and tarragon; you could use any combination you like. Getting back to the soups, we made a cold Polish beet soup, Chlodnik. This soup’s most notable feature is its bright pink color. It combines cooled beets and other raw vegetables with lots of dairy, including kefir — something very popular in Poland, but new to my American friends. I urge you to give kefir a try. I’ve read that it has five times the probiotics found in yogurt; add it to a smoothie or try one of the flavored versions. 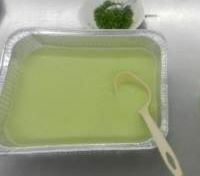 We also made an asparagus vichyssoise. This was a little different than the version I make in Poland where the asparagus is white; I must admit the green color was very attractive. 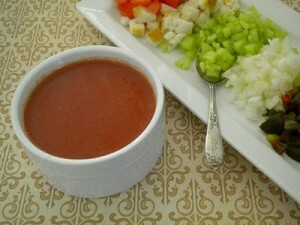 A Spanish gazpacho finished off our trio. This has been one of my favorites ever since the 1980s, when we spent four years living in Spain, and I researched gazpacho and sangria all over the Iberian peninsula, but that’s another story. As for our soups, there were many trips to the kitchen to refill our bowls, but no clear favorite. So take a break from salads this summer, give these soups a try and let me know which one you would choose. 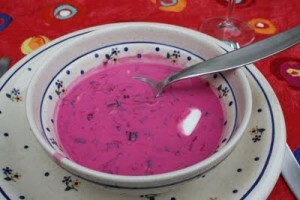 And you need to add the wonderful cold cherry soup that is a feature of summer in Hungary. When I went to the International Week at the University of Pecs in 2011 we all had some for a late afternoon snack at the University library. Someone asked, “What’s different about this one?” And then we all had great fun discovering what the word was for cloves in all the languages represented around the table! Cold cherry soup, Lori? That sounds fantastic; I’ll have to google it. As you know, they’ll be selling Polish cherries on every corner in a month or two.